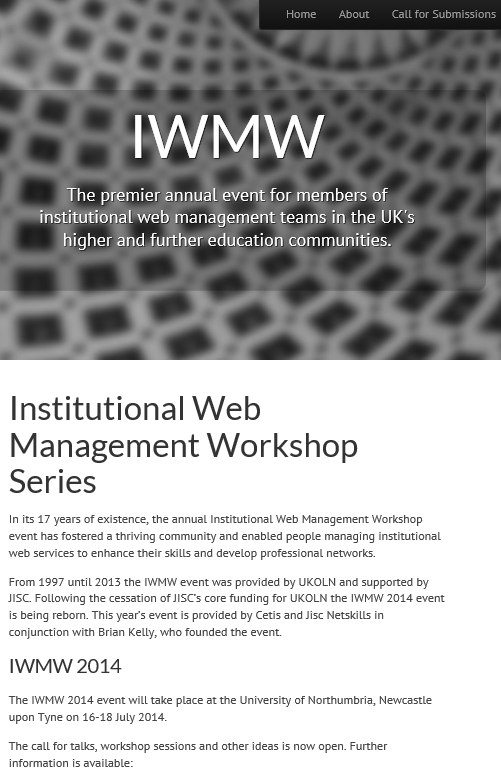 The Institutional Web Management Workshop series (better known as IWMW) was launched in 1997. The event aimed to develop a sustainable community of practice for those with responsibilities for providing institutional web services. The event has been running for 17 years and has attracted participants from the web management community from across the UK’s higher and further education sectors. The growth of important of the web to support a range of institutional activities has also seen the event attract participants from beyond web teams, including those with responsibilities in teaching and learning and research, in addition to those with interests in marketing, design, user interfaces, gathering user requirements, accessibility as well as the technical aspects of providing large-scale web services. For the past 17 years the event was provided by UKOLN with funding to support the organisation and planning for the event being provided by the JISC. In light of the cessation of JISC funding for UKOLN at the IWMW 2013 event we explored ways in which the event could be sustained without Jisc funding and backing from UKOLN. The feedback at the event made it clear that there was strong demand for the event to be continued. I’m pleased to announced that the IWMW event will continue! The IWMW 2014 event will be held at the University of Northumbria on 16-18 July. The event will be supported by myself, Cetis (my host institution) and Jisc Netskills. Although the event needs such institutional support in order to maintain its unique profile, the most important aspect of the event lies in the contributions made by the speakers and workshop facilitators. The event aims to provide a forum for sharing experiences and we wish to continue that tradition. We therefore invite members of the community who stories to share and ideas to explore to submit a proposal for the IWMW 2014 event. We will continue to provide a mixture of plenary talks (typically lasting for 45 minutes) and workshop sessions (lasting for 90 minutes). However we will also welcome suggestions for other ways of engaging the workshop participants. In the past, for example, we have held debates, panel sessions and bar camps. if you feel you like to make use of such approaches, or perhaps even make use of a novel approach, we would love to hear from you. And although we particularly welcome submissions from practitioners in the sector, we also welcome submissions from outside the higher and further education sectors. Details for the call for submissions are available from the IWMW Web site. Alternatively feel free to get in touch with me if you have any questions, ideas or suggestions. This entry was posted on 17 Feb 2014 at 10:06 am	and is filed under Events. Tagged: IWMW14. You can follow any responses to this entry through the RSS 2.0 feed. You can leave a response, or trackback from your own site.